The easier aspects of homeopathic prescribing can be done at home. Simple first-aid prescribing, and common ailments of coughs and colds can often be successfully prescribed for by the home prescriber for his or her family. The over-arching principle which homeopathy is based on is “the law of similars”. This underlying principle is always the same, but the way it is applied will vary based on the type of disease or trauma being addressed. At the level of first aid prescribing, the application of this principle is extremely easy, as it is based on a constant relationship between a particular physical shock, and the remedy which always relates to it. The remedy which everyone should have in their first aid kits is Arnica. In the first aid jurisdiction, it can be given for every shock or trauma involving a contusion, such as from a fall, or being hit by something. This is pretty much a constant remedy for parents to use with their kids while they are in the first 7-year cycle of growth, which I wrote about the other day. 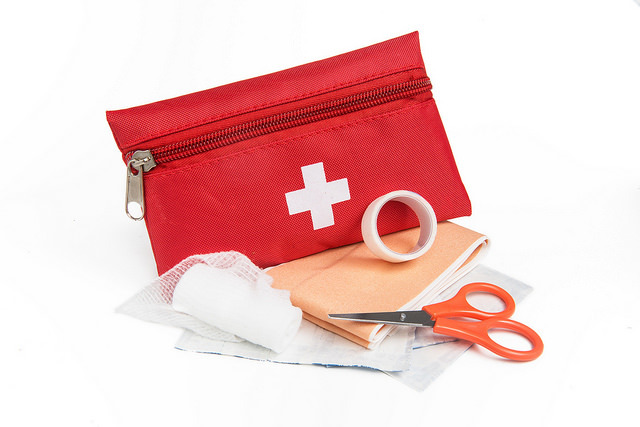 Start a list on the inside of your first aid kit, which says “Arnica for Contusions”. It will be your best friend for sore muscles, and any time you overexert yourself physically. The next remedy on this list would be Hypericum, which is useful in any case involving damage to the nerves, such as an injury which crushes the fingertips, which are a very nerve-rich area. Also for any dental procedure, which is also a very nerve-rich area. So add to the list in your first aid kit “Hypericum for nerve damage”. Aconite is sometimes called “The Arnica of the eye” – any contusion to the eye will benefit from early and frequent dosing with aconite. You can write it that way in your first aid kit : “Aconite is the Arnica of the eye”. What about splinters, or other objects that lodge themselves under your skin? Silicea is the remedy which helps expel any foreign objects, and is best used in a low potency, such as 30ch. Warning : do not use silicea if someone has an internal medical device, such as a pacemaker! Write on your first aid list “Silicea to expel foreign objects”. What would you use for a bee sting? Apis is specific for bee stings, along with any condition with similar symptoms, such as rapid swelling, redness, and itchiness, as some may have from allergic reactions. A high potency of Apis (such as 10m) is good to carry by anyone who has strong allergies of any kind. To remember the basic version of this, write “Apis for bee stings” in your first aid kit. What about food poisoning? You know, when something was a little off with your recent meal, and it has decided that it needs to come back out through every orifice you own? Cold sweats, queasiness, and feeling like you’re on death’s door are all a part of this very unpleasant experience. Arsenicum is the specific remedy to treat food poisoning generally, or Carbo Vegetalis, if the food poisoning was specifically from fish. Add that to your first aid kit. These remedies, in conjunction with a well-trained approach for handling any first aid situation, are relatively easy to learn and apply, as their application is very formulaic. You certainly don’t need to have a Heilkunst consult to figure out which of these remedies to use, although in the midst of the heightened emotion in such a situation, it is usually best to have at least one person on the scene who can make a more objective judgment about what is needed by the patient.